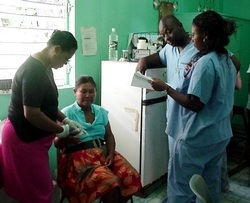 ​The Salybia Clinic is located on the north eastern side of Dominica, in the heart of the Kalinago Territory. SMP student volunteers who help staff the Saturday clinics travel on prearranged transport service for their day long experience. On each Thursday before a scheduled clinic, the Clinic Director/Coordinator will send out an email notice to all members for clinic registration. Interested SMP members should responsed to this email promptly if they wish to attend, as sign up is first come first serve. The Clinical Director/Coordinator will send out a confirmation email by 12 noon on the Friday to those members who will be attending the clinic. *Members who are unable to attend their confirmed clinic and fail to inform the Clinical Director/Coordinator VIA e-mail by 6pm on the Friday before the clinic will forfeit this privilege for the rest of the semester. ​On the day of clinic, SMP Members are asked to meet outside the school library at 7:45 a.m. ﻿Since the Territory lies on the far side of the island past Melville Hall Airport, those members who are known to have motion sickness are asked to take their Dramamine (or other ant-nausea medication) 30 minutes prior to departure. *If you do not have one, e-mail the clinical coordinator to inquire about purchase one for $25.00 EC. ​memories & photos of their clinical encounters. so they can be considered for inclusion in our site's SMP Voices or other pages.